What made you decide to write a graphic novel? Were you always a fan of the medium and had this story on your mind for a while? Anthony Bourdain: I've been a comics fan since childhood--when I was a serious collector of early Marvels (1960s, MAD, horror comics--later began collecting EC's, a few Golden Age, and late 60's West Coast Undergrounds). An early ambition was to be the next R. Crumb. Sadly, my illustration skills--while decent--were not up to anywhere near that standard. When Joel Rose brought the idea back up after an earlier discussion, I thought, "What red blooded American boy in his mid fifties wouldn't do a graphic novel if given the chance? Let's try! As long as we can do it right." The fact that Vertigo, very early on, was supportive of the kind of high quality art we were looking for made all the difference. How have your travels across the world informed this story? Did you draw inspiration from anything specific? AB: Well, I clearly love Japan--and am obsessed with hyper-fetishistic, uncompromising old school style sushi, and due to my travels, have been lucky enough to spend a lot of time there. But the book reflects a lot of my food obsessions (funky classic brasserie/bistro) and prejudices. Travel changes you. It exposes you to things. My love of street food is certainly a product of my travels. Food culture as a whole has been a bit of a phenomenon in the media over the last few years, but not so much in comics. Was that part of your motivation for wanting to create Get Jiro? AB: I think the explosion of interest in chefs and restaurants is certainly easy fodder for satire. But my motivation was really nothing more than to help tell a story that would be fun, extremely bloody, beautifully illustrated--and insanely detailed as to the specifics of cooking and eating. I'm a big fan of classic Japanese cinema, Hammett's Red Harvest, spaghetti westerns and food--so these were obvious elements. Your co-writer, Joel Rose, and artist Langdon Foss have both done comic work in the past. What was it like working with them, and how did their experience with creating comics help shape the book? AB: Joel is the very first guy in the world to have ever published me--back when he ran the legendary Lower East Side literary magazine, Between C and D. He's a friend, whose books I admire enormously, who's been supportive--an even instrumental--in my career since the beginning, for over two decades. It surely helped that he also worked on some of the most influential graphic novels of the last decades and that he had previous relationships with Vertigo. Most importantly, he knows how to tell a story. I care less about that. I'm all about dialogue and atmospherics. I think we complement each other's work nicely. I hope so. 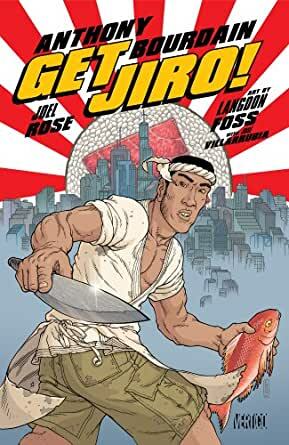 While Get Jiro, the original is a real read for chefs, with a lot of commentary on where the food scene was going back in 2008 (yes it was published later on, but the efforts and atmosphere best reflect then) this comic far better written, and showcases the real evolution Tony has gone through in his writing and worldview...while being more in line of his real viewpoint. Blood and Sushi is the prequel to the previous Get Jiro, and show an evolution in writing that the original lacked. The food scenes are more organic and less forced, feeling as a cohesive piece, acting as a tie to the complete narrative. In addition, the uses of violence, background characters and character drama reference classics in Japanese cinema, while also setting up the tone known best in Get Jiro. Never mess with the chef. In addition, this showcases a serious character drama that better reflects the character at an earlier stage in his life, one that is never easy, but with a great deal more attention to detail on the worldbuilding that led to the original...which seemed like a separate universe than the one we know in the restaurant business today. All of that said, I think both stories are incredible, but this is more approachable to those not in the food business. Know that up front, and get reading already. 4,0 de 5 estrelasA good prequel but the original is still the Original. I preordered this ages ago and I forgot about it. Shows up one day and I finish reading it that day. I like it, but it's not as good as the first one. Less about food really, but I do like the little references it makes to food when it does. No regrets though, I love the cover art. I've been a comic reader for 3+ decades now, though I fortunately fallen off the wagon a few years ago. I read about Get Jiro! on the fantastic web comic, Unshelved, and realized I needed it. So I got it. The story was excellent, the art supported it nicely. Lots of fun, but as most comics like this are, you feel kinda like you spent too much money for a comic. One thing that I thought was awesome cool was that a few days after that President Obama ate at the actual Jiro's in Tokyo during a state visit. 4,0 de 5 estrelasIt's all about the skills. I had no idea how important gangland assassin skills were behind the scenes at the great sushi bars. But now I know.